With the world changing so rapidly, could Cross-Cultural and Cross Generational, Experiential Learning present a viable and inclusive answer to understanding what we need to know in order to address the seemingly insurmountable issues of the economy, social cohesion and the environmental challenges that are facing us today? With educators pressing for the need to take more flexible and dynamic hands on approaches to learning, could Cross-Cultural and Cross Generational inclusive methods of experiential learning change the way in which we see the world and the roles we take on that will bring us happiness and meaning in our lives? Could this type of learning bring greater valuation and relevance to the acquisition and application of wisdom in our societies, over simply the accumulation, consumption and storage of knowledge? These are questions that go deep into the psyche of humanity asking us to be open to the many different and viable options there are for learning. Could Cross Cultural and Cross Generational Experiential Learning be a path to finding, choosing and creating a meaningful life, where your pursuit of happiness and what you do in life are one and the same thing? Johannes Pfister is the founder and CEO of ThinkCamp non-profit cooperative and inspiration behind the UnaVision initiative, whose objective is to offer unique learning environments and learning activities throughout the world. Unavision fosters project based learning, eco-social entrepreneurship, common goods economy and sociocratic governance. Leading with initiatives such as the Ecoversities and Global Marshall Plan network, Unavision is providing learners with the opportunity to seek alternative University based educations that are driven by the students desire to forge their own learning experiences in a unique, global learning environment. With projects that span from Kosovo to Oaxaca in Mexico, Unavision, its founder and its communities are working to co-create learning experiences that cross the culture and generational divides where practical and experiential projects are created that also bring meaningful work to local communities. Annie Levin is a doula/attorney/pollinator who collaborates with individuals and organizations re-imagining the ways we build community, weave narratives, support childbirth, and enact social change. A graduate of Harvard Law School also trained in mediation, psychology, and permaculture design, she believes that the complex problems facing our world require creative, cross-disciplinary solutions. Annie currently serves as a curator for The Emergence Network. She resides in Brooklyn, NY. Education has always been a very important part of my life and I consider myself a Life Long Learner. Ten years ago I left the Denver, Colorado, USA, to travel to Mexico, Central and South America. Soccer has also been a large part of my life and I have been fortunate to have traveled throughout the U.S. and Europea amd participated in tournaments in Denmark, Germany and Sweden. One of the motivating factors in the leaving the states was to travel and I lived in Costa Rica for two years, Peru for two years, Mexico for two years and I traveled to Honduras, El Salvador, Panama, Belize, Nicaragua, Bolivia, Ecuador and Colombia. I had the opportunity to visit many pyramids, historical sites and museums and to become familiar with many people and their cultures. I look forward to traveling to other continents and to discovering more cultures over the next 30 years of travels. During my trip I met Lainie Liberti and Miro and they have become a part of my extended family and we have kept in touch for more than 5 years. Lainie, Dixie Aragon, and myself had many conversations about education and the role of home schooling and world schooling. I have seen Miro grow into an intelligent young many who has benefited from World Schooling. Dixie and I have settled in Merida, Yucatan, Mexico for the past two years and have opened LIOTA – Language Institute of The Americas – which is a subsidiary of The Universal One International Academy and we are having a blast We are a non-traditional school and offer language instruction, robotics, coding, science and STEM instruction. We are serving as Logistics Coordinators for the April 2017 Project World School Conference, and are looking forward to meeting up again with Lainie and Miro and to meet many other interesting global citizens. You may check us out at Languageinstituteoftheamericas.com, Universal One International Academy and our Facebook pages. Looking forward to some interesting conversations with you all!! I was born in Richmond, California, grew up in Boulder Colorado and graduated from the University of Colorado with a major in Spanish. Along the way I obtained two Master’s degrees, my Educational Administrative license and various certificates. I taught Spanish, Advanced Placement Spanish Language, and English as a Second Language in Colorado, Texas and California. I am fluent in Portuguese as well and understand French and Italian and intend to learn Arabic this year. My son and I left the United States ten years ago and have been traveling in Mexico, Central America and South America. We have settled in Merida, Yucatan, Mexico for three years and have opened the Language Institute of the Americas, which is a subdivision of Universal One International Academy. We are Creating a global School much as the Xavier Academy developing future global citizens. We offer in person and on line classes and have a Dormitory which sleeps 12 individuals for Total Immersion classes and Summer classes. Bubba and I have been teaching English, Robotics, and Computer programming Applications on our travels. In addition, we are the Corporate Trainers of employees of El Diario de Yucatan ( the #1 newspapercompany in the Yucatan) Newspaper which is owned by Mega Media of Mexico, and have been teaching English for the past one and a half years at three locations in Merida. In our travels we met Lainie Liberti and Miro over four years ago in Nicaragua and have stayed in contact with our friends over the years. We were even roommates in Huanchaco, Peru and had a blast sharing our adventures. Lainie encouraged me to start a blog site which I named Conscious Baby Boomers. We have other sites as well such asLanguageinstituteoftheAmericas.com, Universaloneacademy.com,Tlalikalli.com, Theuniversalhome.org – which is adobe housing construction. It is our mission to be Agents of Change and to serve and educate the under served communities in which we live in whatever way possible. We are truly thankful for the opportunity to present our information and knowledge to a larger community and are here to help you learn another language as well as other subject matter. Bringing projects to life that touch people and create meaning in their lives is a passion for George! George Kaponay, is a dedicated explorer, social entrepreneur and life learner who along with his wife Bobi and their twin children, daughter, Réka and son, Lalika, have been traveling the world since 2011 on a journey of learning and discovery, which has seen them visit 32 countries on six continents. Committed to experiencing life together, George and his wife Bobi made the decision to take their children out of the traditional schooling system over six years ago and have not looked back. The entire family is committed to a life of learning together, while traveling and embracing change as a constant inspiration for their growth and development. In 2016 they are engaging on a tour of the UK and USA to promote their 15 year old daughter’s debut novel Dawn of the Guardian www.dawnoftheguardian.com which was released earlier in the year. George and Bobi are also shortly launching their Labour of Love Incubation Program (www.labouroflove.us), designed to provide a face-to-face, live working forum, intended to assist people, families and groups to find, define. launch and bring to fruition their very own Labour of Love pursuit. As always, you can find out more about your host, Lainie Liberti at her website RaisingMiro.com and the alternative education & world schooling project she runs with her teenage son at: ProjectWorldSchool.com. You can also connect with her on twitter @ilainie & facebook. For comments, questions, suggestions or if you’d like to be guest on the show, please contact us here. Have questions or want to be a guest on the show? Contact us here. 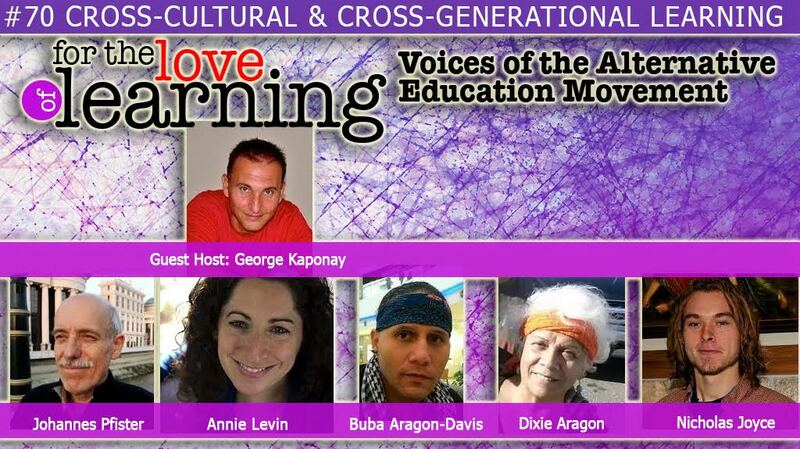 For The Love of Learning - Voices of the Alternative Education Movement airs live every Monday 8:00 pm – 10:00 pm EST on the Conscious Consumer Network. For the Love of Learning Show is aired on the Conscious Consumer Network (CCN). Other shows on CCN provide opinions, recommendations, or other information from various individuals, organizations, sponsors, or companies. The producer team of For the Love of Learning Show does not endorse, guarantee, warrant, or recommend the accuracy of such information or necessarily subscribe to any such opinions or content presented. For the Love of Learning Show is an independent online show which uses CCN for live broadcasting and is not directly connected to other shows aired on the network.